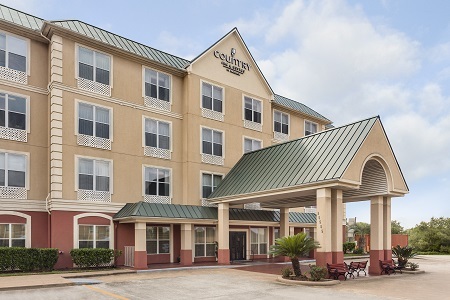 Located minutes from George Bush Intercontinental Airport (IAH) and top businesses in the Energy Corridor, the Country Inn & Suites® by Radisson, Houston IAH Airport - JFK Boulevard is an ideal base for your visit. Our free shuttle heads to the airport every 30 minutes, so you never have to worry about Houston traffic. 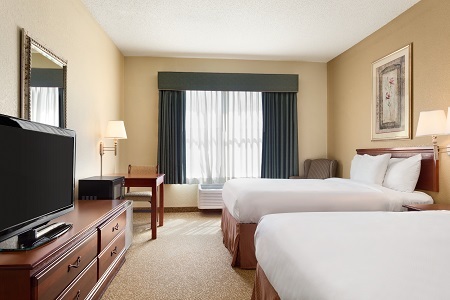 After a long trip, stretch out with a jog in our fitness center, or walk through nearby downtown to check out the unique shops and restaurants. You can stop by the Theater District to catch a Broadway show and then head back to the hotel to lounge in your comfortable room. Free Airport Shuttle, 5:00 a.m. - 11:30 p.m. Traveling with family or need extra space? 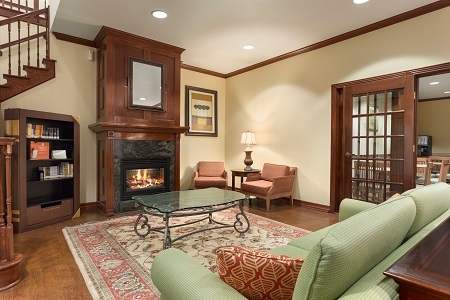 Reserve a One-bedroom Suite to enjoy a private bedroom and a separate living room with a sleeper sofa. 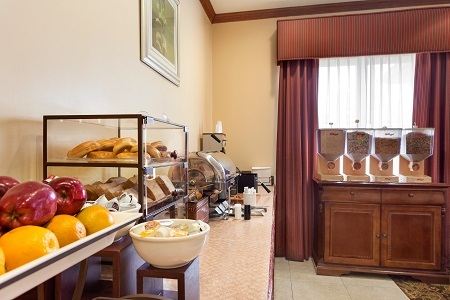 Our free, hot breakfast features Belgian waffles, savory sausage and fresh fruit. If you’re in a hurry to catch a flight, grab a bagel and a cup of coffee before heading out the door. For lunch and dinner, visit one of the restaurants within five miles of the hotel. La Cabana Mexican Restaurant & Cantina serves up Tex-Mex favorites, and Jimmy G’s Cajun Seafood Restaurant dishes out gumbo and jambalaya. Deerbrook Mall – This popular alternative to the crowded Houston Galleria is about 15 minutes from the hotel and houses all your favorites like Macy’s, Barnes & Noble and JCPenney. To sweeten a shopping spree, stop by Great American Cookies for a rich Double Doozie. Old Town Spring – Drive about 20 minutes to visit Old Town Spring, a charming community with dozens of shops, restaurants and art galleries. Make plans to attend the annual Texas Crawfish and Music Festival, an event that celebrates the town’s heritage with carnival rides, concerts and, of course, tasty crawfish. Theater District – Located 25 minutes away in downtown, the Theater District is a major hub for the arts that features Broadway-style shows and performances by the Houston Symphony Orchestra and the Houston Grand Opera. Stop by the famous Alley Theatre to see adaptations of works like A Christmas Carol and Around the World in 80 Days.